Navy warships were outfitted in dazzle camouflage to confuse enemies. Not all camouflage is created equal. At the height of the First World War, while fighting tirelessly through the air, ground, and sea to help secure the freedoms we enjoy today, a problem arose for the Allied Powers that seemed to have no end in sight. Out on the Atlantic, British and American ships importing desperately needed supplies for the people of England were being targeted and destroyed without mercy by German U-Boats. On both sides of the pond, some of the greatest military minds of the last century were working tirelessly to devise a way to guarantee safe passage for these critically important vessels. Traditional camouflage was of no help. Out at sea, factors beyond human control such as the color of the sky, clouds overhead and the constant churning of the ocean made it impossible to create a disguise that could work under any conditions. As the British Admiralty and US Navy racked their brains for a solution to this problem, an unexpected creature became the source of their inspiration: zebras. In 1917, while serving in the Royal Navy Volunteer Reserve, British artist Norman Wilkinson devised a brilliant strategy. If the ships have no conceivable way of blending in, could they avoid a dreadful fate if they instead decided to stand out? 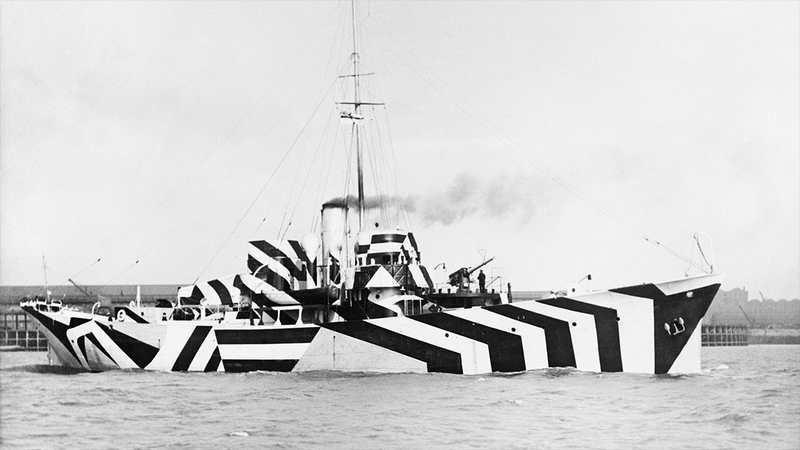 From this idea, dazzle camouflage was born. A strategy rooted in disruption and confusion. If the torpedoes targeting Allied ships weren't able to determine how fast they were going, where they were headed, what type of ship it was, or pinpoint a ship's exact stern and bow, this could give them the minute edge they needed to finally outrun their adversaries. Beginning in August 1917, more than 4000 British merchant ships and over 400 Naval vessels were dressed head to toe in intricate patterns of geometric shapes and contrasting colors, all interrupting and intersecting with each other. 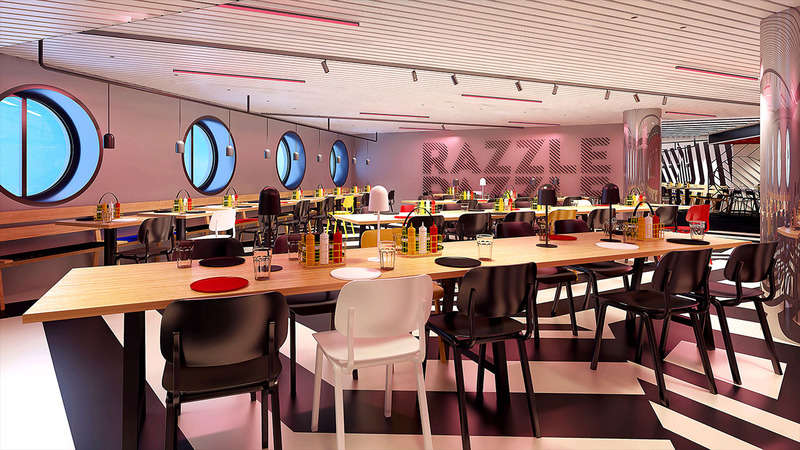 Razzle Dazzle will be Scarlet Lady's signature onboard eatery. A strategy so unexpected and so unique that even Pablo Picasso raised his hand to take credit for an innovation he considered a quintessential Cubist technique. How does this tie into delicious dining on the high seas? We thought you'd never ask. Razzle Dazzle is one of our Scarlet Lady's most spectacular culinary attractions. A space that doesn't disguise what it's doing, because there's so much to experience you won't want to go to the bathroom out of fear you might miss out on what's coming next. But, who knows? There might even be a few surprises in store when you take a quick leave to freshen up (there's only one way to find out). Serving familiar favorites from breakfast to dinner, prepared from consciously sourced ingredients served in a fresh, no frills, and downright delicious way. There's sure to be something here for every sailor from scrumptious toasts to juicy burgers and zesty, vibrant salads. With so much variety, you won't need to worry about checking the menu ahead of time for that one picky eater in every group (you know who they are). Razzle Dazzle is vegetarian forward but there's something for everyone to enjoy. But the fun doesn't end where the food begins. There's still so much more for sailors to discover. After your meal, or before, make your way to the Red Bar, our resident diva's favorite spot on the entire ship. Serving up the perfect blend of naughty and nice. If you're feeling nice, you can order from our robust offering of fresh-pressed juices and tonics. If you're feeling naughty, we'll have an exceptional selection of clarified cocktails that vary every night. Feeling excited yet? "Pardon us, did you say something about divas?" As a matter of fact, we did. Razzle Dazzle will also be home to our tantalizing Drag Brunch. A uniquely Virgin Voyages take on one of the most popular activities to help you nurse that hangover while working on a new one. For two days on every voyage, our dashing, delightful, beautiful, sassy, scandalous, and scintillatingly spectacular drag queens will take over this space to provide some entertainment even Sin City wouldn't know what to do with (snaps for the queens, please). All bets are off when you hand over the reins to our regal runway goddesses, our queens of contour, our captains of everything and anything glittery (their favorite color). If Scarlet Lady is the most popular attraction you can find on the seven seas, then Razzle Dazzle is the perfect place to indulge in both your naughty and nice cravings. The catch? There is no catch. It's not a secret, it's not a mirage, and it's definitely not an attempt to trick you into not knowing which way we're going. You'll know exactly where we're headed, but the only way to experience all the fun is to join the voyage.